Ehren Painter’s memories of one of his first Premiership appearances will always stand out, mainly because it was on an afternoon where he was part of a Northampton Saints side that finally did the double over their old foes Leicester Tigers. 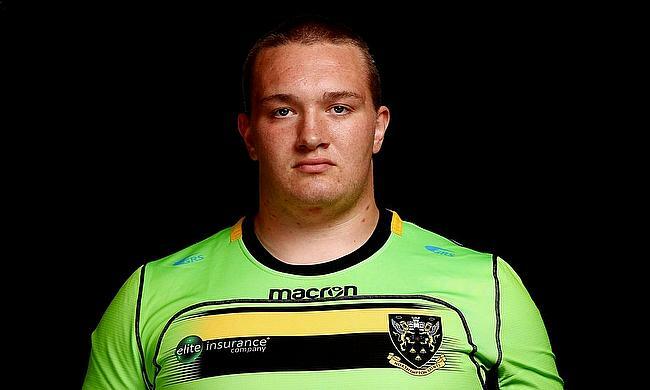 Saints’ rising star is currently on international duty with England U20s at the World Championships and is recalling his experience of playing at Welford Road. It was April and Northampton had just been thrashed 63-13 by eventual Premiership winners Saracens, but in the East Midlands derby, Painter announced himself on one of the biggest stages. After replacing Paul Hill in the second half, Painter produced a 16-minute cameo in the Saints pack which helped Northampton to a first away win over the Tigers in 11 years. After such an instant impact, Painter has continued to impress and a whirlwind couple of months could end with success on the international front as England look to regain their World U20 Championship crown in France over the next 10 days. Painter has already lifted silverware with Northampton this term after they won the A-League and it seems like the only way is up for this talented youngest who began his love affair with the sport just seven years ago. As a boy, he turned out for Chelmsford Rhinos at second row and also represented Felsted School coached by former Wasps prop Andrew Le Chevalier. From there, his rise has been rapid. He was picked up by Northampton at the age of 15 before appearing for England Under-17s and England Under-18s as well as Northampton Wanderers and National One side Cambridge. A first team debut came against Saracens at Franklin's Gardens two months ago and all of these experiences guided Painter to his moment in the spotlight against Leicester. At the end of last month, Painter tweeted ‘One game at a time’ and you get the sense that this humble 20-year-old uses that approach himself as he continues to grasp his opportunities. His surprise at his call-up to the England U20s squad highlights this point despite Painter making such an impression with Northampton towards the end of the season. England resume their World U20 Championship campaign this evening against Scotland having already secured their place in the semi-finals following victories over Italy and Argentina in Pool B. Painter is set to start in southern France tonight and after losing to the auld enemy in Six Nations this year, England’s focus is purely on their final group stage match rather than what lies ahead further down the line. The England squad to face @Scotlandteam in the #WorldRugbyU20s tomorrow evening. LIVE at https://t.co/yJBXV0E0LM from 20:00 BST ?? Whilst Painter’s mind may well be on Scotland and potential glory with England, there will be a moment this summer where he will have time to reflect on a quite remarkable few months in a career which seems to hold so much promise.